Jakarta, offeecially the Special Caipital Territory o Jakarta, is the caipital an lairgest ceety o Indonesie. Locatit on the northwast coast o the island o Java, it haes an aurie o 661.52 square kilometers an a population o 9,580,000 (2010). It is the maist populous ceety in Indonesie an in Sootheast Asie, an is the twalt-lairgest ceety in the warld. The metropolitan aurie, Jabodetabek, is the seicont lairgest in the warld. 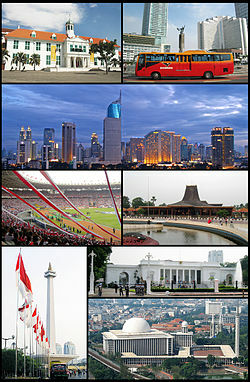 Jakarta is leetit as a global ceety in the 2008 Globalization and World Cities Study Group and Network (GaWC) research. The ceety's name is derived frae the Auld Javanese wird "Jayakarta" which translates as "victorious deed", "complete act", or "complete victory". Established in the fowert century, the ceety became an important tradin port for the Kinrick o Sunda. It grew as the caipital o the colonial Dutch East Indies. It wis made caipital o Indonesie when the kintra became independent efter Warld War II. It wis umwhile kent as Sunda Kelapa (397–1527), Jayakarta (1527–1619), Batavia (1619–1942), an Djakarta (1942–1972). Landmarks include the Naitional Monument an Istiqlal Mosque. The ceety is the seat o the ASEAN Secretariat. Jakarta is served bi the Soekarno-Hatta Internaitional Airport, Halim Perdanakusuma Interniational Airport, an Tanjung Priok Harbour; it is connectit bi several intercity an commuter railways, an served bi several bus lines runnin on reserved busways. ↑ "Travel Indonesia Guide – How to appreciate the 'Big Durian' Jakarta". Worldstepper-daworldisntenough.blogspot.com. 8 April 2008. Retrieved 27 April 2010. ↑ "Jakarta Population 2014". World Population Review. Retrieved January 13, 2015. ↑ "The World According to GaWC 2008". Globalization and World Cities Study Group and Network (GaWC). Loughborough University. Retrieved 2009-12-07. Wikimedia Commons haes media relatit tae Jakarta. Dependent territories an states wi limitit recognition in italics. This page wis last eeditit on 10 Mairch 2018, at 19:13.